Alfred E. Green’s Technicolor extravaganza The Jolson Story purports to tell the story of Al Jolson, one of the most popular singers in the United States in the 1920s and ’30s. What it actually does is take the bare bones of Jolson’s life story and tell a mostly fictionalized show-biz story of a man’s unalloyed love of music and his tireless quest to touch the hearts of every man, woman, and child in America. That he often touches their hearts while wearing blackface makes The Jolson Story a tricky movie to watch and review in the 21st century. Unlike the white actors in blackface in D.W. Griffith’s The Birth of a Nation (1915), who blacked up to portray their characters as brutes, villains, and rapists, or the minstrel-show comedians who used burnt cork on their faces to portray “those funny little darkies” as shiftless and uneducated objects of ridicule, Jolson used blackface strictly in the context of musical performance, and there was never anything deliberately mean-spirited about it. But no matter what the context, it’s hard today to look at a white person with black makeup covering every part of their face except a wide area around the mouth meant to convey the impression of big fat lips and not cringe. Born Asa Yoelson in 1886, Jolson emigrated from his native Lithuania with his mother and his siblings in 1894. They joined Jolson’s father, Moses Yoelson, who had been rabbi and cantor at the Talmud Torah Synagogue in Washington, D.C., since 1891. Late in 1894, Jolson’s mother died, which had a profound effect on him, and he reportedly became completely withdrawn for seven months. In 1895, however, he was introduced to show business by entertainer Al Reeves, and by 1897, he and his brother Hirsch (whose stage name was “Harry”) were singing on street corners. The brothers continued in show business for several years, but eventually “Al” and “Harry” had a falling out. Jolson first appeared in blackface in 1904 in a show at Keeney’s Theatre in Brooklyn. According to John Kenrick, blacking up created in Jolson “a sense of freedom and spontaneity he had never known before.” His blackface performances, and his black character, “Gus,” became wildly popular. Jolson probably wasn’t the first American popular musician who ironically experienced feelings of “freedom” by appropriating the appearance and attitude of a black man, but he was the first and perhaps most significant of the century that also gave us Benny Goodman, Elvis Presley, the Beastie Boys, Vanilla Ice, and Justin Timberlake. Jolson’s popularity grew and grew in the ‘teens and ’20s, culminating in his appearance in the film The Jazz Singer (1927), which was the first “talkie,” or film with a synchronized soundtrack. There wasn’t much dialogue in The Jazz Singer, and most of the sound came from Jolson’s songs, but when he said, “You ain’t heard nothin’ yet” (a phrase he had already made famous in his stage performances), Jolson carved his place into history. The Jazz Singer tells a fictionalized version of Jolson’s own life. Jolson’s character, Jake Rabinowitz, sings jazz music as “Jack Robin,” and even debuts on Broadway, but he is forever in conflict with his deeply traditional father, who wants Jake to be the sixth generation of Rabinowitz men to sing as cantors in the synagogue. The dramatic conflict is eventually resolved when he nearly misses his Broadway debut to sing the Kol Nidre in the synagogue, allowing his father to die a happy man, and then follows it up with his appearance on the stage, in blackface, in which he goes down on one knee to sing “My Mammy” to his mother, who is sitting in the front row. Of course, Asa’s Old World parents don’t approve of his love of popular song, especially his father, the cantor (Ludwig Donath). His mother (Tamara Shayne) is a little more understanding. Little Asa hops a train to Baltimore to follow Martin, who wanted to make him a part of his act, but he gets picked up by a copper and taken to St. Mary’s Home for Boys. His parents come up to collect him, but when they hear him singing “Ave Maria” in the boy’s choir at the orphanage, their hearts soften. “Singing without his cap on,” Cantor Yoelson tsks-tsks. “It’s not so much what’s on the head, as what’s in the heart,” says Father McGee (Ernest Cossart). With his parents’ support, Asa goes on the road with Steve Martin. “Give that boy a spotlight” becomes the whole act, with Asa as Martin’s ringer in the audience. When his voice breaks during a performance, Jolson turns it into a whistling performance. He’s a consummate performer, and the show must go on. The transition from childhood to adulthood in The Jolson Story is nicely done. Scotty Beckett and Larry Parks (who plays Jolson as an adult) look eerily alike, which helps. There’s a montage of Jolson’s performances across the nation represented as postcards sent home to his parents. He performs in all the big cities, as well as smaller towns, like Walla Walla, Washington, “the town so nice they named it twice.” Less than a half hour has gone by, and already his parents (both of whom remain living for the entire picture) are completely supportive of his musical career. The Jolson Story is pretty short on dramatic conflict. At the half hour mark, we finally see Parks as Jolson black up when he substitutes for a performer named Tom Baron (Bill Goodwin) in Churchill Downs, Kentucky, after Tom wins a “snootful” at the tracks and gets good and drunk. 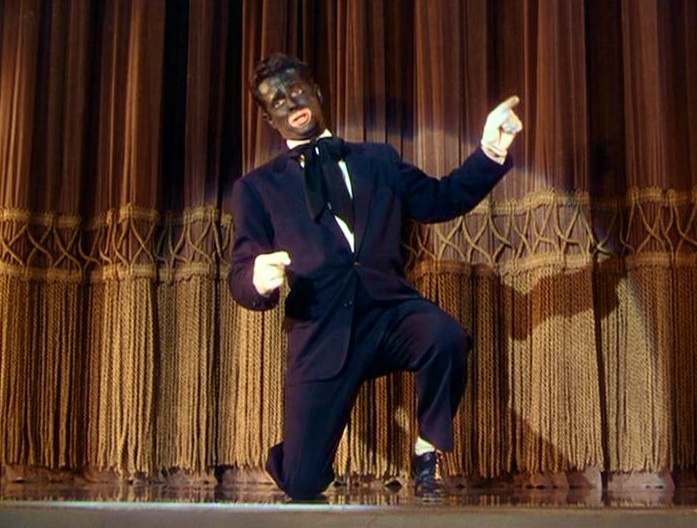 This is Jolson’s breakout moment, and it’s worth noting that the blackface and nappy wig make him anonymous, and indistinguishable from a completely different-looking white performer once he corks up. It’s not long before Jolson bristles against the mawkish and old-fashioned music he performs for Dockstader as part of the chorus. When the group performs in New Orleans, Jolson wanders off into the black part of town. This sequence features the only real black people you’ll see in The Jolson Story, although none of them have speaking parts. Jolson hears genuine ragtime music as he sits in with a band (sans blackface, of course) loving what he is hearing. He goes back to Dockstader and says, “I heard some music tonight called ‘jazz. '” But Dockstader is happy with the show the way it is. “Son, minstrels have been doing fine for fifty years, and we take pride in doing it the way it’s always been done,” Dockstader tells him. By “nobody,” he means, of course, no white people, since the (presumably black) composers and musicians he refers to are never shown. It could have been interesting to see Jolson work with and collaborate with black artists, but after that brief scene in New Orleans, we never see another black person. Jolson gets a call from good old Tom Baron, and Jolson tells him he has all kinds of music that just needs to be “polished up” a little (no pun intended) and makes his debut on Broadway, singing “Mammy,” in blackface, down on one knee. Interestingly, he does so without a nappy wig — just his dark hair slicked back — and he sounds “blacker” than he ever did before. Jolson is depicted as a man who is always desperate to make a connection with his audience. During his show “Honeymoon Express,” he even has the house lights turned up, so he can see everyone in the audience. This was also the scene in which I felt that his blackface looked the most insane. There’s a superimposition of his face singing over a left-to-right pan of the crowd, and the closeup shows just how crazy his blackface looks, with a wide area around his lips un-made up, showing the white skin around his mouth, his pink lips, and his small yellow teeth. His eyes are nearly maniacal, he’s clearly sweating under his makeup, and he’s superimposed over a crowd of laughing, happy white people. It’s the stuff of nightmares. When it comes to Jolson’s personal life, this picture makes Jolson seem like a singing monk, when in reality he was an inveterate womanizer. In The Jolson Story, he has no relationships with women except for his lifelong chaste romance with childhood friend Ann (Jo-Carroll Dennison). As soon as she marries another man, however, he meets his future wife, producer Florenz Ziegfeld’s newest female sensation, Julie Benson (Evelyn Keyes). He spots her in the audience at one of his shows, and asks her to request a song. After she says, “April Showers,” he practically lies down on the stage in front of her and sings his heart out. Interestingly, this is the first time in the picture he sings a really heartfelt number without blackface on. Maybe it would have been too strange for audiences of the time to see him romance a white woman while blacked up. After the show, he finds her mimicking his performance of “California, Here I Come,” perfectly copying his resonant voice and wild arm and leg gesticulations, and he falls, hook, line, and sinker. Even though “Julie Benson” is a complete fabrication, I would have liked to have seen even more of her. Keyes only gets one proper musical number, showing her in action as part of the Ziegfeld Follies, but her dancing and singing were impressive, not to mention the fact that she has one of the best pair of gams I’ve ever seen. As I said, there’s not much dramatic tension in this picture. Marrying a shiksa doesn’t raise an eyebrow on either one of his parents’ faces, and the only real conflict comes later in the film, as Julie encourages Jolson to quit show business so they can have a quiet life together, but he clearly misses the limelight, even though he claims he is happy. Jolson was something of a has-been in 1946, and he was no longer one of the most popular singers in America, but this film was a huge hit, and revitalized interest in his music. It even spawned a sequel, Jolson Sings Again (1949). Larry Parks was nominated for an Academy Award for best actor, but didn’t win. Parks was a relatively unknown B-movie actor before he was cast in this role, which launched him into stardom. Not too many years later, however, his career would be destroyed by the House Un-American Affairs Committee, when he admitted under pressure that he had once been a member of the Communist Party. He testified against his will in 1951, and was never officially blacklisted, but his career hit the skids. His performance in The Jolson Story really is excellent. He lip-synched all of the songs to recordings of Jolson’s voice, and the effect is seamless. He plays Jolson as a man who is pathologically addicted to stardom, but never makes him seem maniacal or inhuman. 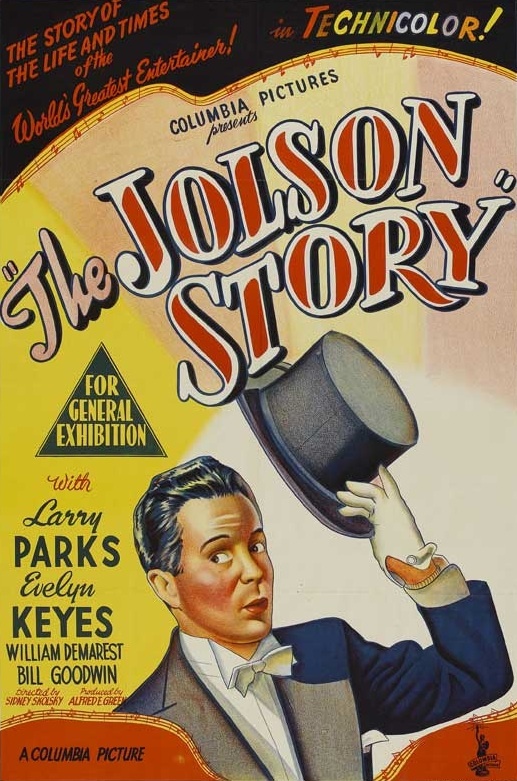 The Jolson Story took home two Oscars in 1947. Morris Stoloff won one for best musical score, and the film also won an Oscar for best sound recording. William Demarest for nominated for best supporting actor, and Joseph Walker was nominated for best color cinematography (the only other nominee in this category, The Yearling, ended up winning). Posted in 1946, October 1946 and tagged 19th Academy Awards, Al Jolson, Alfred E. Green, Andrew Solt, Arthur Morton, Bill Goodwin, Blackface, Columbia Pictures, Drama, Edwin Wetzel, Ernest Cossart, Evelyn Keyes, George Duning, Gordon Griffith, Harry Chandlee, Hugo Friedhofer, Jack Cole, Jo-Carroll Dennison, John Alexander, Joseph H. Lewis, Joseph Walker, Larry Parks, Ludwig Donath, Marlin Skiles, Martin Fried, Morris Stoloff, Musicals, Saul Chaplin, Saul Silverman, Scotty Beckett, Sidney Buchman, Sidney Skolsky, Stephen Longstreet, Tamara Shayne, The Jolson Story, The Robert Mitchell Boy Choir, William A. Lyon, William Demarest. Bookmark the permalink.